Tag line: "Alien abduction. November 5, 1975. White Mountains, Northeastern Arizona. Based on the true story"
Going back as far as 1957, there have been reports of alien abductions, with seemingly normal people claiming that they were kidnapped by “otherworldly” creatures and subjected to a series of experiments. Naturally, such stories are difficult to swallow; if I ever encounter someone who says they were taken aboard a mother ship and “probed” by aliens, I’d probably have a hard time believing them, and might even think they’ve lost their mind. It’s not an uncommon reaction, seeing as most members of the scientific community dismiss the possibility that abductions actually occur, chalking them up to fantasy, temporary insanity, etc. But are these people truly crazy? Dr. John Mack, a psychiatrist and professor at Harvard University, released a report in 1992 saying that, of the 60 abduction cases he researched, none of those he interviewed showed any signs of mental illness. What’s more, the “abductees” came from all walks of life: secretaries, students, housewives, etc. Most told similar stories, and were convinced, beyond a shadow of a doubt, that their experiences were 100% genuine. 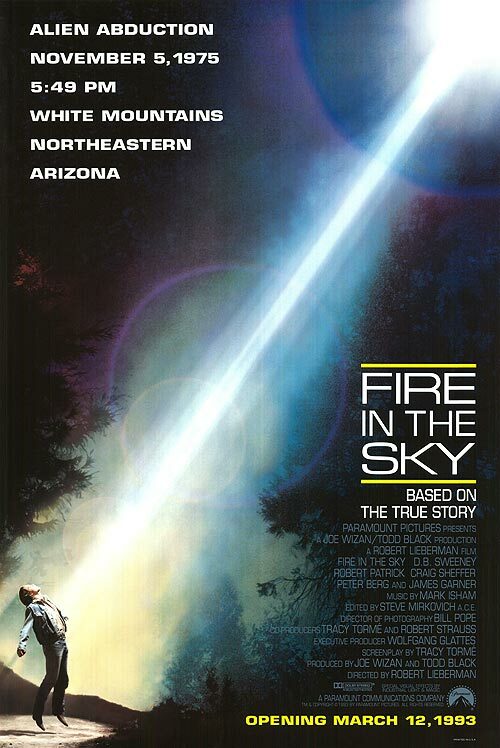 Inspired by real events, 1993’s Fire in the Sky is a dramatized account of what happened to Travis Walton (played here by D.B. Sweeney), a laborer from the town of Snowflake, Arizona, who vanished without a trace one November evening in 1975. Part of a 6-man logging crew, Travis and his co-workers, including his best friend Mike Rogers (Robert Patrick); fellow Snowflake residents David Whitlock (Peter Berg), Greg Hayes (Henry Thomas) and Bobby Cogdill (Bradley Gregg); and newcomer Allan Dallis (Craig Sheffer), had finished clearing some trees in an area of the White Mountains, and were on their way home when they spotted a bright red light in a clearing up ahead. At first, they assumed it was a fire, but what they found instead was a UFO, hovering just above the ground. While Mike and the others were trying to figure out what it was, a curious Travis got out of the truck to investigate, and a moment or two later was hit with a beam of light (emanating from the UFO) that threw him backwards about ten feet. Believing he was dead, Mike sped off, only to return a short time later to look for his best friend. But there was no trace of Travis, nor any evidence that a UFO had even been there. Once back in Snowflake, Mike, Bobby, and the rest told Sheriff Blake Davis (Noble Willingham) about the incident, and, feeling it was a bit more than he could handle, the sheriff called in noted investigator Lt. Frank Watters (James Garner) to assist him. After hearing the whole story, Watters was convinced the group was not only lying, but covering up a possible murder. Before long, the entire town, including Mike’s wife Katie (Kathleen Wilhoite) and his sister Dana (Georgia Emelin), who was engaged to Travis, began to have their doubts as well, and wanted the remaining five to take a lie detector test to see if they were, in fact, telling the truth. Based on the book “The Walton Experience” by Travis Walton himself, Fire in the Sky works on a number of different levels. For one, it’s an effective mystery, leaving us to wonder what really happened on the mountain that November night (the abduction sequence is presented as part of a flashback, shown while Mike is talking to Lt. Watters, and because of this we, like everyone else, think it might be a cover story to hide the truth). In addition, the movie offers an intriguing glimpse into small-town life, and how circumstances can cause people who’ve known each other for years to turn against one another: almost everyone in Snowflake believes Travis was the victim of foul play. Travis’s brother Dan (Scott MacDonald) even goes so far as to threaten Mike if he doesn’t come clean. But the best scenes in Fire in the Sky are towards the end, when Travis finally reappears. As with the rest of the movie, we eventually see what happened to Travis (via flashbacks) during his absence, and without going into too much detail, it’s positively horrifying. 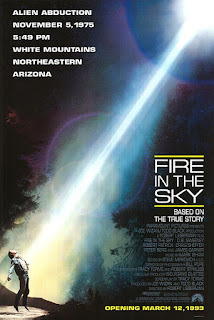 I found Fire in the Sky fascinating for most of its running time, but these final sequences had me on the edge of my seat. Whether Travis Walton was abducted by aliens or not, I cannot say. But I’ll tell you this: his story, truth or fiction, translated very well to the screen.